In my last post, I suggested some ideas for reworking old cards. I also have a lot of T-shirts that I can’t get rid of. What can I say….I am a sentimentalist! 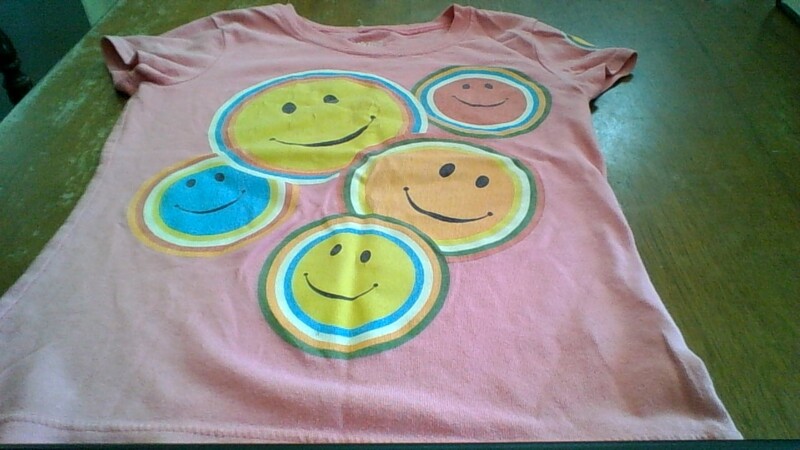 There are cutie little t-shirts that the kids grew out of, souvenir t-shirts from a great vacation…you get the idea. And so today I present a couple of options for reusing t-shirts. 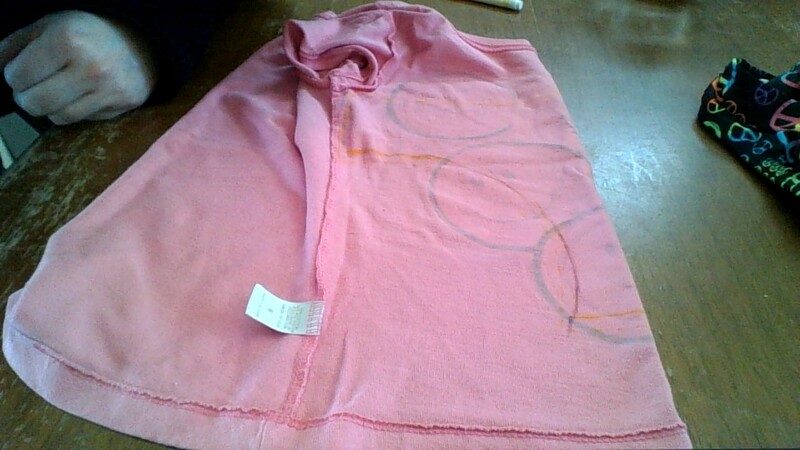 The first idea is to make a pillow out of an old t-shirt. 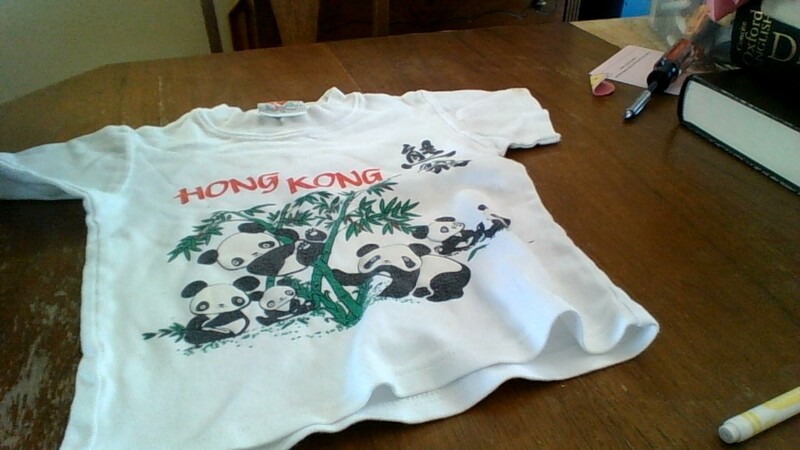 The one that I used was a child’s size three from our trip to Hong Kong. It was a two-sided shirt, so made a two-sided pillow. Because it was such a tiny t-shirt, I had to add some fabric to make it big enough. I used an old sweater of mine, and added a border around the largest square I could cut from the t-shirt. To be honest, this was quite time consuming, and it doesn’t look as good as if I had simply turned the edges of the t-shirt square under and sewn it onto a larger square of fabric. 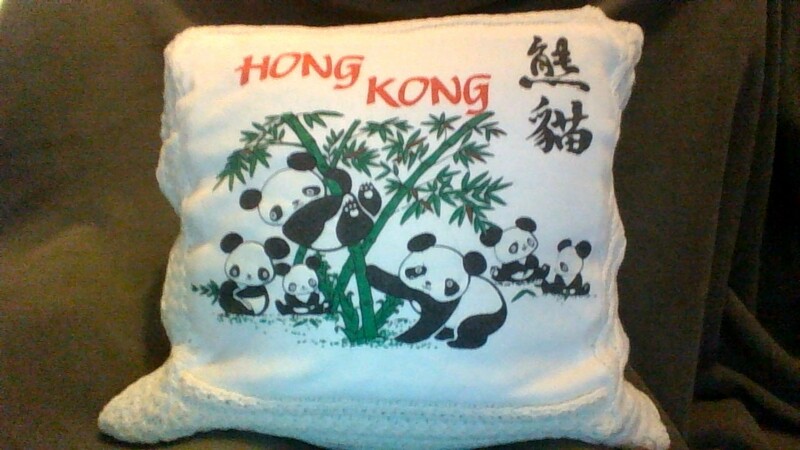 Nonetheless, the pillow is still cute. 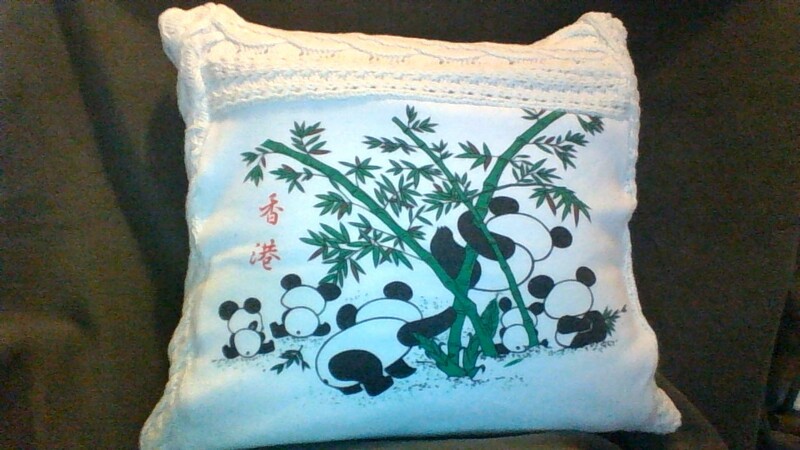 I also added a zipper on the bottom of the pillow so that it is washable, if necessary. My second idea was a bit more involved, but perhaps more practical. I turned a little girl t-shirt into some big girl underwear! 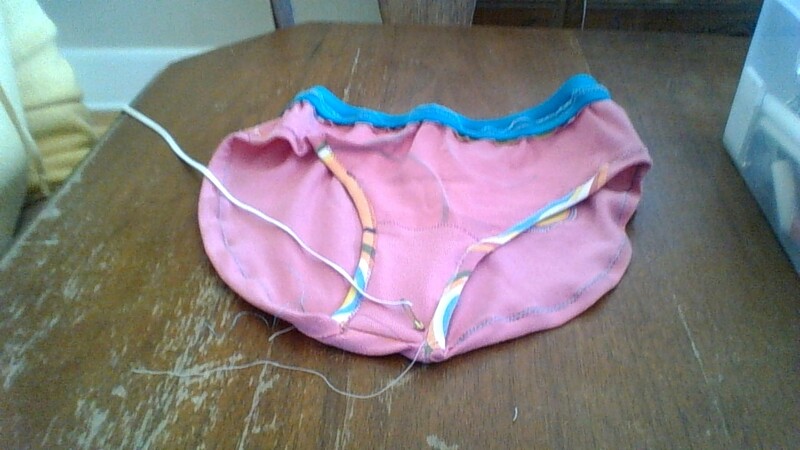 I began by using another pair of underwear as a pattern. I tried to centre the design on the front of the underwear. 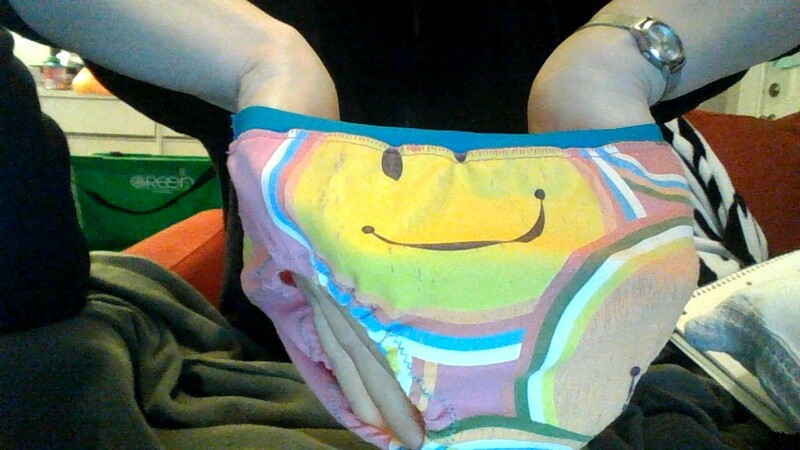 I also cut out a little face from the sleeve and added it to the back of the underwear for extra awesomeness. 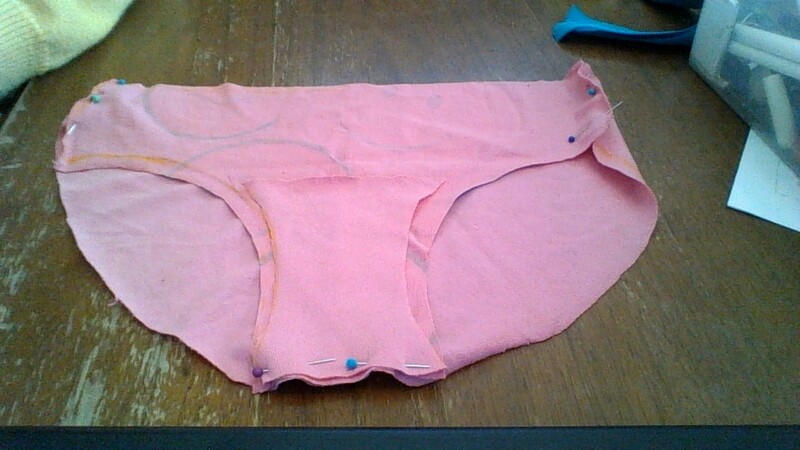 After cutting out the front and back, I also cut out a lining for the bottom of the underwear. 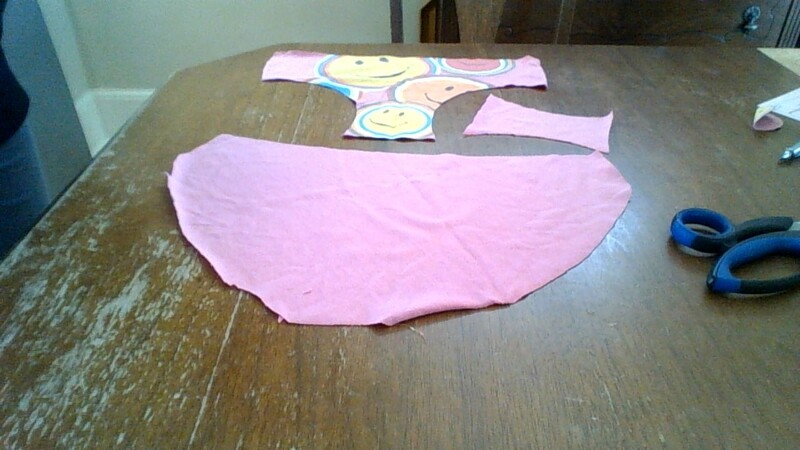 The next step is to sew the front to the back, right sides together, including the lining (the lining should be pinned to the wrong side of the back piece when sewing the bottom seam). Next, measure out the length of elastic needed for the waist. Sew the ends together to create a circle. 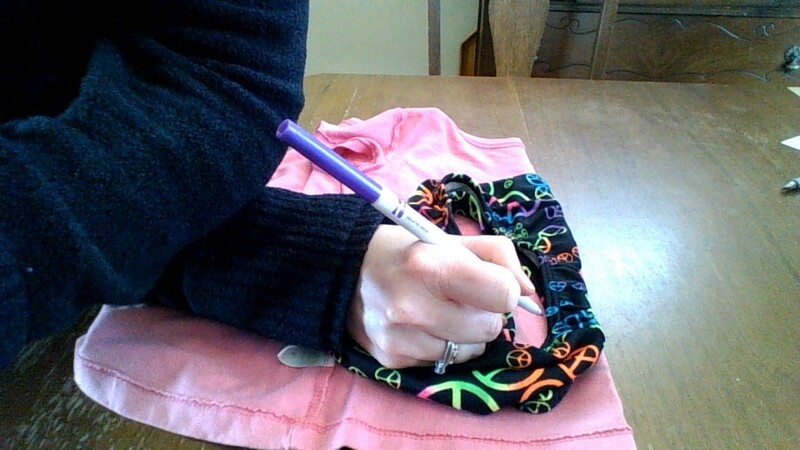 Mark the halfway point and pin to the waistband, wrong sides together. Flip the band up and sew again to keep the elastic up. Again, measure out the length of elastics needed for the legs. I made casings for these elastics, but you could probably do it the same as the waistband. Before sewing the final seam around the legs, hem the top of the lining, and fold up so that the lining will be sewn into the leg hems. OMG too cute! I love both projects, but those undies are too cute! Well crafted as well.